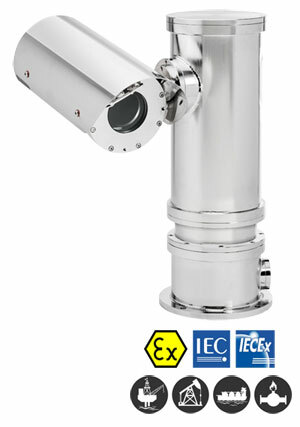 316L Stainless steel explosion proof PTZ camera ATEX/IECEx certified. Integrated Bosch DINION IP Starlight HD camera with built-in video analytics to improve level of security. Integrated motorized autofocus zoom lens. Integrated Fiber optic media converter for direct fiber termination into the PTZ. Integrated 115-230V/24V transformer. No need for Exd junction box.